It seems like a long time ago that a mysterious PR flyer arrived through the letterbox at ReadItDaddy Towers. A lot has happened since then. We now have this darkly delicious blog to talk about 'grown up' books (or should I say 'more grown up books') and Malorie Blackman's star has deservedly gone stratospheric as she is now the new Children's Laureate. I'm new to her work but I'm hooked, simply because Noble Conflict weaves exactly the kind of story world I'm inexplicably drawn to. Talk about dystopian futures, divides in society, conflict and rebellion and I am there with knobs on - and that's what you'll find wrapped between these black luxurious covers. The story begins with an introduction to the main character, one Kaspar Wilding, a freshly scrubbed new recruit to the Order of Guardians. Call them peacekeepers, a security force, but they are the front line in a futuristic world where the thread of order is frayed and dwindling. We follow Kaspar's progress through boot camp initially, but soon we also encounter the main meat and bones of the story as The Guardians are repeatedly attacked as insurgents strive to undermine their ordered society. Kaspar soon finds that there is far more behind the scenes with the seemingly random acts of terrorism. In conjunction with computer genius Mac, a cute purple haired 'civvy' working alongside the Guardians, Kaspar uncovers a plot and becomes more directly involved with the insurgents as he meets one face to face after a traumatic incident while out in the field. Kaspar soon finds himself on the wrong end of both the Guardian chain of command and the insurgents themselves as he fights to uncover the truth. As we follow Kaspar's quest, it's easy to draw comparisons with what's happening in the world today and from what I read, this is something that Malorie Blackman specialises in. 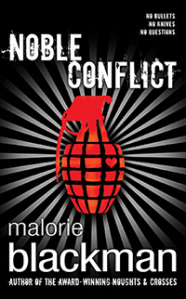 Drawing allegorical comparisons between the fight for liberty versus the war against terror, "Noble Conflict" is addictive stuff and I particularly love Malorie's 'balls out' approach to her character's dialogue and depth. You'll be expecting a twist, and there is a huge one. You may also be expecting closure and resolution but unless we get to revisit Kaspar's world (and I dearly hope we do) you'll be left wanting more by the time you finish this book. "Noble Conflict" By Malorie Blackman is from Doubleday, and was released on 6th June 2013.